An Ancient Murrelet in Hakodate Bay this Tuesday morning. I walked down to see if the Brent Geese were still there (they were) and was surprised to see this alcid so close to the touristy area. Not really close (the pic is a fairly heavy crop) but much closer than usual. A nice find, only the second one I've seen in Hakodate. I've seen several others in various locales, late winter/early spring often sees auks visit the harbours and bays but it's usually Rhinoceros Auklets. There was still some snow and ice around but it was sunny and windy, I'm sure that's the end of winter. A bit of a strange one, this one of 2009/10. More Hoopoes than Crossbill/Waxwings (one versus zero). No Asian Rosy Finch. No influxes of any winter passerines at all actually, not even Brambling or Bullfinch. Not a single Siskin or Redpoll and hardly any Buntings either. Where did they all go? It was a good winter for Brent Geese though and today there was a flock of 35 in Irifune Port. They were pretty restless, I'm sure they'll be off in a day or two. They kept flying off and coming back. Nice to get some Brent BIF shots for a change. Whilst on the ground they were either strutting around squabbling or resting. I said last week it was the last time to see them this winter but I was wrong. I'm glad I could get back one more time. Here's a video of them preening and getting ready to depart. It was windy so the sound was brutal: I replaced it with sound effects. I tried some Gull sound effects but it didn't sound like the local Gulls at all. See, I have some standards. Lots of Red Breasted Merganser about, a few Goldeneye and Pintail plus the Harlequin Ducks of course (none of those species came close enough for a photo though). I tried to find the Hoopoe again but couldn't. Apparently there were a few in south Hokkaido the last week or so. The Coot was still on the river and the usual small birds were still present. Like this Daurian Redstart. And this Dusky Thrush was from today. Today was a bit duller weather-wise. I noticed this duck yesterday but didn't give it a second glance, I assumed it was just a female Mallard. I took a closer look this morning though. It is, I think, a female Gadwall. This isn't so common round here, I only see one or two a year. There were quite a few Gulls on the river including this individual. Note the leg colour (yellow). This is one of those 'taimyrensis' type Gulls. Many years ago there were 2 species of Gull. Herring Gulls and Lesser Black Backed Gulls. They were closely related and had lots of different subspecies. Now they have been split into god knows how many different full species and this is an intergrade between 2 of those. Vega Gull and Heuglins Gull to be precise. It's darker than a regular Vega Gull, such as this one also on the river today. You can see our bird is clearly lighter than the resident Slaty Backed Gulls (which aren't in a complex that has been split.................yet). the Slaty Backed is the one in the foreground. So what is it? A Heuglins Gull? A Taimiyr Gull? Soon to ID a Gull you'll need to get a blood sample and sequence its DNA. I almost got a nice Long Tailed Rosefinch picture today. A male near my apartment. I got up to watch Bayern v Man U very early this morning. Whilst I smirked a little at the result I'm now thinking oh god Rooney is injured before a World Cup again. I hope it isn't too serious. Actually it doesn't bear thinking about. It would be a crying shame if the only mark he ever made in a World Cup was on Carvalho's groin. It might also mean England's World Cup hopes rely on someone like Carlton Cole or Darren Bent. Oh dear. Still, let's be positive. It may only be something like 4-6 weeks out which would mean Man U's season may implode (which would be nice) and he'd be fresh and raring to go in South Africa (which would be even better). I noticed the first fuki shoots near my flat, a sure sigh spring has sprung. By the way I've changed my blog name from 'S.C.E' to 'Stu'. The original stood for 'Stella C Eagle' (oh how witty) but I got tired of that so I'll just use my real name. I've changed the photo too, it's only a few months old. But by god I look cool don't I? Click on this link if you have the time. Thanks, I appreciate your support. 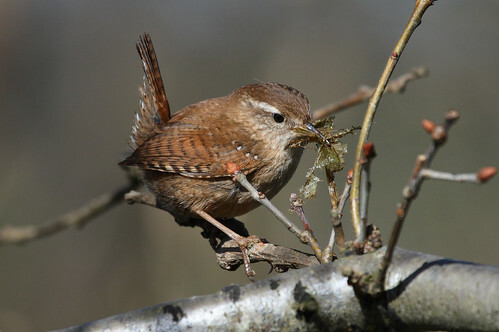 A Wren in England. This was the first (and only so far) time I'd been back to the UK with a digital camera. This bird was down a country lane in Hutton, about 20 minutes walk from my parents' place. The same species is present in Japan but the subspecies in east Asia is much darker than those in England. A nice find this morning, a Hoopoe about 100 yards from my flat! A scarce bird in Japan but probably commoner than in the UK. I've seen several in Japan over the years. It was a bit nervous and kept flying off, the local Crows were harrying it. This is the second I've seen in Hakodate, the last one was on March 30th 2005. That arrived after some very strong westerlies as did this one (last weekend saw some terrible windy weather with heavy snow too). Strange to see them when there's snow on the ground, they're a bird I associate with sunny olive groves. This is the second exciting bird since I last posted. The other was a juvenile Stellers Sea Eagle flying over the sea yesterday. Too far off for anything but a record shot (I won't bother posting one here) but a local tick, I think that leaves my Hakodate list on either 194 or 195. I went to Kamiso last Friday but not only were there no birds it was absolutely freezing too. No photos from that day. Yesterday I walked down the river and was surprised to see a pair of Red Breasted Merganser well upstream. Here's the male. I got much closer than this and the bird was in perfect light and just as I was ready to press the shutter one of those right wing propaganda trucks switched on its loudspeaker and the ducks flew off never to be seen again. Morons. '"F**king Facists Foil Foto" was the working title of this post until the I saw the Hoopoe. Lots of Hawfinches too, this one was from yesterday. I think I overdid some of the colours in today's photos, some (like the one above) look a bit artificial.........hmmmm. These ones were taken through a mesh fence this morning. I could have added 'fences' to the original title of this post too. So Liverpool decided to start playing well with only half a dozen games to go. Looking at Villa's collapse and the run-ins for Spurs/Man City 4th place may still be possible I suppose. Click on this if you have the time, I'll be grateful as it means I'll shoot up the rankings. I walked down to Irifune Port today to see the Brent Geese. They usually depart at the end of March but they were still present today. About 30 all in all. It was a nice day for it, very springlike. As winter finishes Oyaji Noise Season begins.This is the time of the year when the City Hall has to spend the remainder of its construction budget meaning scores of noisy probably pointless projects are taking place across town. The Brent Geese were pretty noisy too and were honking and squabbling away. I took a lot of video clips, I filled a 16GB card in fact..........here's a little compilation I made. They are a very photogenic bird (even if the exposure can be a tad tricky). I changed the colour profile on my camera to Adobe RGB (instead of sRGB). This is supposedly so I can make better prints. It might mean that if you're looking at these photos on certain browsers the colour may be a little muted. If it is that means I f**ked up something on the way from my camera via Canon DPP to Photoshop. Let me know if it that is the case. I looked it up on several sites but too be honest it was a little above my head and my eyes are tired and now I just want to relax and open a cold beer. Not much else around. A Black Necked Grebe in full summer plumage, groups of Red Breasted Merganser, a few Scaup, Pelagic Cormorant and so on. In town it's been very quiet. Still lots of Hawfinch and Dusky Thrush, a lone Coot has been on the river the last 3 days and a male Kestrel flew over on Sunday. The latter 2 species are much rarer here than in the UK. There were also lots of Harlequin Ducks today but they were a bit far away for a decent shot. Liverpool were abject again against Man U. Torres was doing Heskey impressions in the 2nd half, Gerard has stopped caring, bar a couple of others the rest of the team isn't good enough and Benitez is sitting pretty on a huge contract that makes him unsackable. Please click this ranking link if you have the time. It won't do anything to your computer but it will make me appear slightly more popular in the Japanese birding blogging community. So it's got to be worth it. In Crossbill invasion years like 2009 the Crossbills tend to come to the ground more from late March as they have often exhausted the pine cone supplies up high on the tree.